After I was sure that I wanna buy the car, I needed to find a company to bring the car to Germany. Well, I used the most common search web site in the internet www.google.de and found this site www.movecars.com, where you can compare different companies. I sent all listed firms an e-mail with my issue or used their contact form. Most of them replied within 12 hours. I decided to use Double A Auto Transport & Moving International, Inc., because they make sure that my car will be transported in the ship and not on deck. 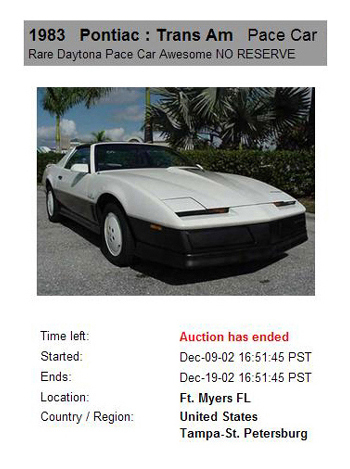 The car was picked-up on January, 16th in Fort Myers and was stocked for 10 days in Florida, Jacksonville. On January, 29th the journey on the "Hual Trubadour 298" begun. I expected my car on February, 13th, but because of the extreme coldness, it arrived on February the 19th, which was by coincident exactly 20 years after the Daytona Race where the Pace Car was introduced to the public. The journey started the night before at 10:30 p.m. in my hometown Landsberg to pick up the car the next morning in Bremerhaven. This was a 500 mile trip by train thru germany. I took a cap right from the trainstation to the port. The nice secretary took me to this huge parking lot where I saw my car right away. Someone forgot to turn the lights off, and therefore the car had a flat battery. Even the car was dirty as hell, it looked exactly like in the auction. For safety reasons I told the seller to put the hubcaps into the trunk so nobody could steal them. The dock worker almost got a heart attack when I started the engine. I drove to a gasstation to fill up the tank and check all the fluids before driving on the highway. I drove the 515 miles without any incidents. I couldn't listen to any radiostations, since american radios work on different frequencies. Thanks God I brought my KISS Destroyer and Unmasked tapes with me so I was able to hear some great music while driving thru Germany. Around noon, the weather was nice enough to take the T-tops off. Since the car came from florida, there was still so much sand in the T-top bags, that I had to clean them on a highwaystop. I arrived back at my house in Landsberg at 8 p.m.. The drive took me 9 hours including 2 longer breaks. The right picture above was taken directly on the A7 Highway ( Autobahn ). The next day I was able to check the car from underneath. There where no signs of rust anywhere. It took 4 days and all kinds of chemicals, towels, 17 bottles of diet coke and whatever to clean the car. Even my little daughter was a great assistance. My friend Chris Firehawk helped me to install the decals on the car. I used a radio of a 2003 Pontiac Grand Prix. You can install it without problems with a Pontiac Fiero adapter.